'Taj Regis' (Barry Blyth, R. 1988). Seedling# S-206-A. TB, 32" (81 cm), Midseason to late midseason bloom. Silky lavender, small brown hafts on falls; chocolate brown to bronze beard. (('Latin Lover' x 'Bayberry Candle') x 'Dutch Chocolate') X (('Love Chant' x 'Festive Skir't) x ('Caramba' x 'Pink Ember')). Tempo Two 1988/89. From Tempo Two catalog, 1988: TAJ REGIS (Blyth 88 Aust) M-ML 32" Sdlg S206-A. A strange silky lavender self with small brown hafts and rich chocolate brown beards. Wide ruffled form and the branching is variable. Some show stems. It makes a lovely clump of colour and it is unique in its colour pattern. ((Latin Lover x Bayberry Candle) x Dutch Chocolate) X ((Love Chant x Festive Skirt) x (Caramba x Pink Ember)). $25.00. 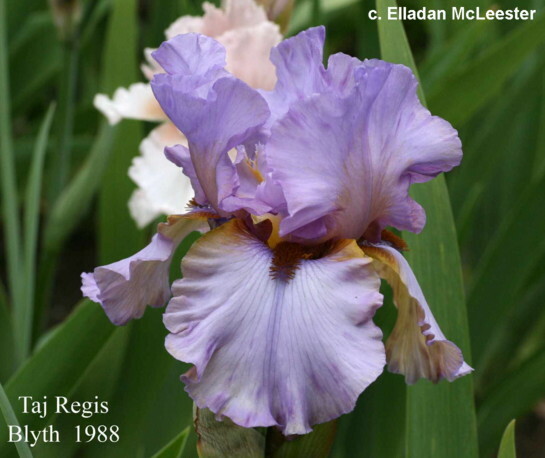 JPG TAJREGIS1.JPG manage 158 K 25 Nov 2018 - 03:50 Main.TLaurin Photo by Debbie Carpenter-Iris Splendor Garden-Australia. JPG TajRegisSI.JPG manage 217 K 17 Apr 2019 - 03:12 Main.TLaurin Photo by Sandy Ives.